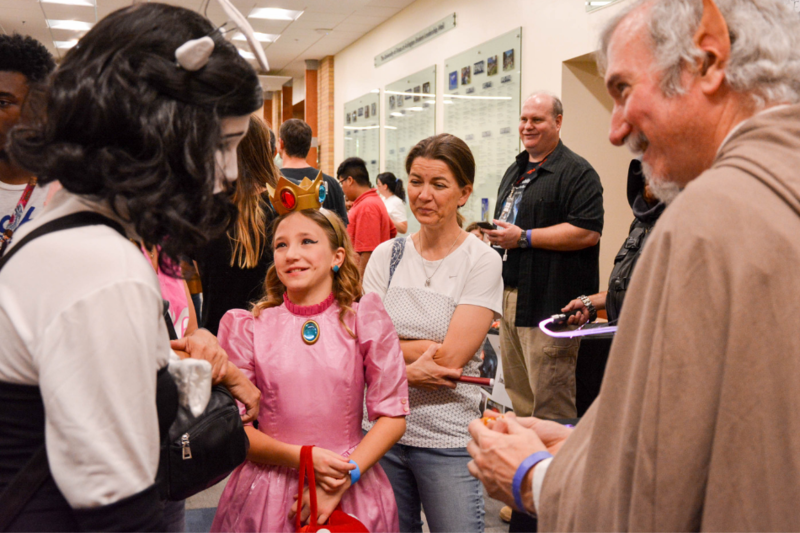 Celebrate fandoms and interests in a family-friendly atmosphere on Saturday, June 15 at the Arlington Public Library’s 5th annual ArlingCon! Attendees at this free pop-culture convention will find a welcoming and educational environment. Newcomers and longtime convention-goers alike are invited for a day of geeky festivities packed with local crafters, artists, authors, and vendors. ArlingCon will take place from 10 a.m. to 6 p.m. on Saturday, June 15 at the University of Texas at Arlington’s E.H. Hereford University Center, 300 W. 1st St, Arlington, TX 76010. ArlingCon is presented in conjunction with UTA Libraries and other community partners. ArlingCon is a family-friendly event with workshops, discussion panels, children’s activities, vendors, exhibits, cosplay opportunities, and lots more. Past highlights have included charity costume groups like the Rebel Legion and 501st Legion; podcasts recorded live on-site; attendees in elaborate costumes; children’s events provided by Library staff; and local author visits. Over 3100 fans attended ArlingCon in 2018. Since its beginning in 2014, ArlingCon has attracted passionate fans who cosplay, or dress in costume as favorite characters. Cosplay is welcomed and encouraged at ArlingCon. Watch the Library’s social media accounts for costuming announcements such as contests, hands-on workshops, exhibits, and more. Experienced cosplayers who want to enhance the convention experience as a cosplay guest are invited to apply here. Other pop culture fans are also invited to share their love of fandom by being part of ArlingCon. The Arlington Public Library will accept applications for convention volunteers, artists, exhibitors, vendors, panelists and more. See the following application dates. Decisions for workshop and panel presenters, vendors, artists and exhibitors will be announced in April. Application dates are yet to be announced for volunteers and the cosplay contest. ArlingCon is free to attend and there is no registration required for attendees. Save the date to mingle with local cosplay talent, special guests, and maybe make some new friends in the process.